﻿ Apple Fertilizer - A Guide for your Orchard. Fertilizer for Less! Today we’re going to take a look at apples and some of the unique challenges and opportunities growers face. If you’re looking for a good apple tree fertilizer for your orchard, you’ve come to the right place! We are going to go over application rates, timing, and address some concerns about excess nitrogen. It’s a balancing act, finding the right mix of apple fertilizer to keep your nitrogen levels optimal. Too much nitrogen and your fruit quality might go down. Excess nitrogen can also reduce the shelf life of your product. Some orchards suffer from the exact opposite problem, too little nitrogen. Not having enough nitrogen available tends to cause chlorotic leaves before the bloom in early spring. Always remember that apples and other perennials store nitrogen in the root system over winter. As the plants mature they will require less nitrogen provided healthy soil conditions are present. If you maintain a healthy soil microbiome, your apples should accumulate nitrogen over time. 1 gallon liquid Natural Fertilizer and 50 gallons of water (depending on tree density, spray equipment and canopy volume). Apply after the leaves open. Repeat after bloom if the trees require more nitrogen. 2 quarts Natural Kelp and 50 gallons of water. Apply after fruit set. Repeat 3-4 weeks before final harvest. Rates vary according to soil fertility and other inputs used. Lower dilution rates are more effective than higher dilution rates. Two or three applications may be more effective than one heavy application. If other constraints only allow one trip over the field, do not exceed a 3 percent dilution rate (3 gallons organic fertilizers to 97 gallons water). To reduce susceptibility to attack of insects and disease-causing organisms, apply a per-acre mixture of 1 quart Natural Kelp and 50 gallons of water when signs of infestation become apparent. While we prefer foliar application, in difficult soil environments it might be beneficial to give your soil biology a boost with a soil application. Mix 3 gallons of Natural Fertilizer and 30 gallons of water. Apply in spring and fall if soil is hard and low in organic matter. If bitter pit is a problem, add 1 gallon of Natural Liquid Lime to the spray tank to supply additional calcium. Applying a soil fertilizer in the fall will help the roots prepare for the next growing season. So, now you have all the information you should need for application rates and timing. If you plan to setup a new orchard, you should probably be prepared to nurse your plants along for the first few years with foliar feedings while they establish an extensive root network. Are Organics the Best Apple Fertilizers? We surely think so! Organics can be both cost effective versus conventional fertilizer, and the right choice for the environment. Foliar feeding is especially beneficial to growers looking fertilize established plants without also feeding the weeds. If you like what you read, feel free to share! Please be kind and link back to us if you republish this article. 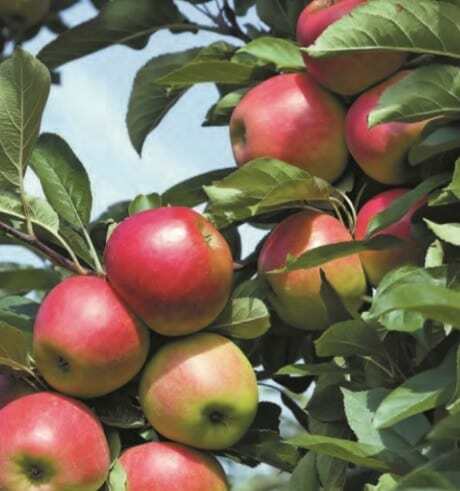 Can apples grow well in coastal kenya have 5 acres and i want try it.